The Jacksons have hosted hayrides and wagon rides that took the guests around through the beautiful countryside of the Stonewall Valley Ranch. One of the favorite locations of guests at the ranch is Cross Mountain. There, up on top at 1800 foot elevation, is a large cross with a 360 degree view of the surrounding hills. Many a wedding and other special ceremonies have taken place up on Cross Mountain. 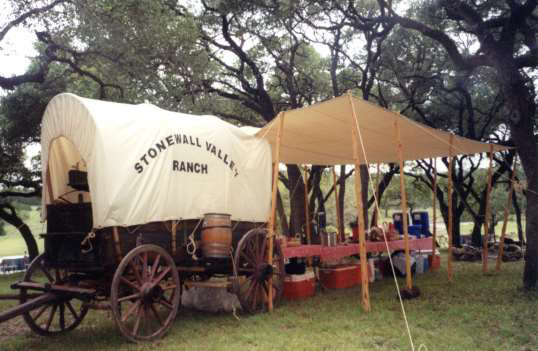 This is the a favorite spot for guests of Stonewall Valley Ranch to gather for cookouts or around the old covered wagon. Comfortable tables and chairs are available under the attached awnings as guests dine and enjoy vistas of the rolling hills that surround the ranch.